Avast Internet Security has plenty of advanced options for those who like to tinker. Installing Avast Internet Security 2014 takes you through just a couple of screens. Regrettably, one of those screens is a software push for installing Google Chrome as your default browser and the Chrome Toolbar for Internet Explorer. Ironically, one of the suite’s services is a browser cleanup tool that “removes annoying browser toolbars from your computer.” Avast’s installer relies heavily on the Internet, so the installation process can be time-consuming if you have a slow connection. Avast’s interface is easy to use, but its multiple colors and font sizes say “freeware” rather than “premium security suite.” The main screen features a large banner that indicates protection level: A green checkmark is good, and a red x is bad. Under the main status are four buttons: ‘Quick scan’, ‘Browser cleanup’, ‘Mobile protection’, and an empty button that you can use to add a quick link to any feature (even help and support). The rest of Avast’s options, including tools such as SafeZone (for banking and shopping protection), SecureLine (VPN), and a link to Avast’s online store, are discoverable through a menu on the left. VPN service is a nice extra: If you connect to a new network, Avast prompts you to select a protection level (private or public) to keep you safe while you’re browsing the Web. Average users might find Avast’s settings menu intimidating. Few explanations accompany the top-level menus. The sheer quantity of advanced settings is daunting, and Avast’s explanations are geared toward fairly experienced users. Though the buttons and toggles are touchscreen-friendly, none of the menus let you tap and drag to scroll—you have to use the tiny, thin scrollbars instead. 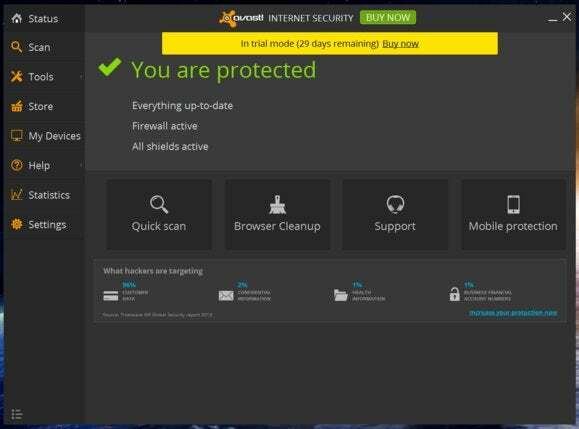 Despite its clunky interface, Avast Internet Security 2014 offers many features you won’t find in other security suites. It could be worth considering if you favor range of features over ease of use.